At 101-pages, this is easily the longest chapter in the book. The first half of the chapter is devoted to a number of sections in which Macchia details the approach he takes to ecclesiology, before an exploration of the classic marks of the church, and a consideration of preaching, sacraments and charismatic fullness as additional marks of the Spirit-baptised church. “The central thesis of this chapter is thus that Spirit baptism gave rise to the global church and remains the very substance of the church’s life in the Spirit, including its charismatic life and mission” (155, original emphasis). Macchia begins with two sections that argue for a relational ecclesiology, in which koinonia is the central motif. The Holy Spirit is the mediator of communion both within the divine trinity and between God and humanity. Spirit-baptism is fundamentally a relational event which issues in the creation of the church as a new community with renewed human sociality. The church is to echo and embody the relationality and open hospitality of the holy Trinity. Thus, “Baptism in the Spirit is baptism into an ecclesial dynamic, the ecclesial Spirit” (167, original emphasis). The church, grounded in the gift of the Spirit, is a network of “graced relationships,” a foretaste of the redemption to come. The ecclesial Spirit sanctifies and transforms us. The power of the Spirit for witness is not some external naked energy which comes upon the church for mighty works, but is primarily “the power of love at work among us” (177). Koinonia is not simply a matter of redemption, for human being is ontologically relational—this is part of what it means to be in the imago Dei. Yet this relationally has been decisively distorted by sin. In redemption, the self is not obliterated but renewed. Macchia develops a relational and ecclesial anthropology in which the dialectic of the self-in-relation and the self-in-solitude (before God) constitutes true and free human being, and which issues in non-oppressive relations. Spirit-baptism decentres the self, renewing and re-establishing it on a new foundation in the love of God. The Spirit is the one in the many. This Spirit brings people into the common life of the divine communion in a way that does not abolish their otherness but rather enhances and fulfills it. They are stripped of their self-centered tendencies and liberated to be all that they were meant to be in the midst of their uniqueness (176). A second set of sections deals with problematic matters in ecclesiology, the challenge of pluralism on the one hand, and the relation of church and kingdom on the other. With respect to the challenge of pluralism, Macchia insists that the claim of the church is grounded in the resurrection of Jesus Christ, who, as the risen and ascended Lord, is the Spirit-Baptizer, the one alone who can and does bring us into fellowship with God. His gift of the Spirit demonstrates and confirms his deity, and hence his uniqueness and pre-eminence. Yet, the Pentecost event is also inherently and radically plural and inclusive—as witnessed in the gift of tongues from all nations. Thus, the church also is a plural and inclusive company, rather than a hierarchical and domineering institution. Macchia insists that ecclesiology must be both christological and pneumatological. To emphasise only one side or the other is to lose the dynamic of the church which is grounded in the pre-eminence of Christ as the saving revelation of God, and/or the diversity and relationality of the church grounded in the baptism of the Holy Spirit. At Pentecost, the legitimate reaching for God implied in various cultures and religious expressions finds fulfillment in the grace of God revealed in the crucified and risen Christ as the one who imparts the Spirit in the latter days. Their differences and past histories are not dissolved but affirmed and granted a new loyalty and a new direction. In the process all idols are forsaken and the cultures are pruned. But the critical pruning is demanded of the church as well. Though the church is the central locus of the kingdom of God in the world, the church is also a loving fellow traveler with the world’s religions while pointing them to the superiority of Christ. Spirit baptism can be developed so as to respond to [the] critique of ecclesiastical superiority in the world but in a way that rejects [the] reduction of Jesus to simply one symbol of the sacred among others (188). Drawing the boundaries of the Spirit Baptizer to Christ alone is exclusivistic Christologically, but…we deal here with an exclusivism of Christ “and not with the self-serving principle of sectarianism.” It is an exclusivism of the one who is uniquely inclusive on the ecclesiological level. … There is simply no way of eliminating the risen Christ as the Spirit Baptizer from the gospel without affirming another gospel (189, original emphasis). Finally, Macchia argues that the relation of the church to the kingdom must be understood dialectically, whereby there can be neither separation nor identification of these two realities. The church is not the kingdom, but is established by the kingdom as its witness and sign (191-192; cf. 165). There is no critical dialectic between Jesus and the Spirit. He is the king and the Spirit the kingdom. But, as noted above, there is such a dialectic between the Spirit/kingdom and the church. Thus, the church is not the final word but a penultimate witness to the word of the kingdom who is Christ (192). Indeed, Macchia suggests that the church will ultimately “exhaust” its purpose when in the eschaton it is “caught up in the more expansive new Jerusalem” (166). This eschatological reserve, together with the knowledge that the church is the church of the Crucified, helps keep the church from being triumphalist. Any continuity between the kingdom and the church is established as a gift by divine grace and is never the possession of the church in itself. The church may strive toward the kingdom, but does so in a spirit of repentance, witness and obedience (197). Frank Macchia, professor of theology at Vanguard University, is a leading Pentecostal theologian and author of many books and articles on the person and work of the Holy Spirit. 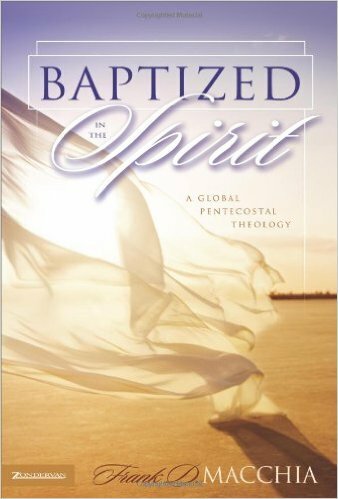 I read about half of his Baptized in the Spirit: A Global Pentecostal Theology (Zondervan, 2006) when it was first released, and began reading it a second time before my lecture at Princeton earlier this year. Over the next few weeks I will post some chapter summaries from this important work in which Macchia explores and extends this central Pentecostal theme. In his brief introduction Macchia argues that “For all their talk about the importance of pneumatology, Pentecostals have yet to couch their narrow pneumatological interest in charismatic/missionary empowerment within a broader pneumatological framework” (18, original emphasis). His aim is to provide just such a framework, expanding understanding of the Baptism with the Holy Spirit (BHS) beyond the narrow confines he finds in the Pentecostal doctrine. He refuses to set the writings of Luke over against those of Paul as some Pentecostals have done. “One needs help from Paul and other canonical voices to negotiate a broader and more integrated conception of Spirit baptism as an eschatological event that is complex in nature” (15). Thus, Macchia defines Spirit-baptism as an eschatological act of the Trinity, its nature being an outpouring of divine love, an experiential reality in the life of God’s people, and functioning toward the witness (and establishing?) of God’s kingdom. The locating of Pentecostal distinctiveness in theological method. Macchia does not find any of these reasons compelling but also seeks to recast the Pentecostal doctrine of Spirit-baptism in light of these realities. Specifically, he wants to view Spirit-baptism as a trinitarian eschatological act that both purifies and empowers, whose essential nature is participation in the love of God. He accepts the exegetical stance of Pentecostal biblical scholars such as Roger Stronstadt and Robert Menzies who focus their understanding of Spirit-baptism on Luke’s writings, but wants to expand it in more holistic directions. This is necessary if Pentecostalism is to contribute its unique grace-given accents to the ecumenical theological table. Pentecostalism has been blessed and gifted by God with certain theological and spiritual accents. We do other Christian families a disservice if we do not preserve and cherish these and seek to bless others with them. Thus, ideal would be a reworking of our distinctives in a way that cherishes our unique accents but expands them in response to the broader contours of the biblical witness and diversity of voices at the ecumenical table (25). Macchia’s discussion in this chapter provides an excellent overview of recent moves in Pentecostal theology, and argues for a “return” to Pentecostalism’s central distinctive. The only clarification I would make here would be to argue against Menzies and even Stronstadt, that the pneumatology of Acts is actually soteric in nature and not simply charismatic. Their view of Luke’s pneumatology is unnecessarily narrow, and drives a wedge between ideas that in Luke are as one. Luke’s pneumatology is both soteriological and charismatic, and his view of the Christian life is thoroughly pneumatological, empowered by the Spirit, and so missional. Here, Macchia’s view of Spirit-baptism as participation in the life of the triune God could prove a helpful corrective to this deficiency in Pentecostal thought. Selection: The Church Dogmatics IV/4:31-40, Baptism with the Holy Spirit. First, Barth reiterates that the beginning of Christian life is the ‘direct self-attestation and self-impartation of the living Jesus Christ’ in the work of the Holy Spirit. He alone is the author and finisher of Christian faith. Jesus Christ himself is the divine change which occurs in a person’s life and by which they become a Christian. 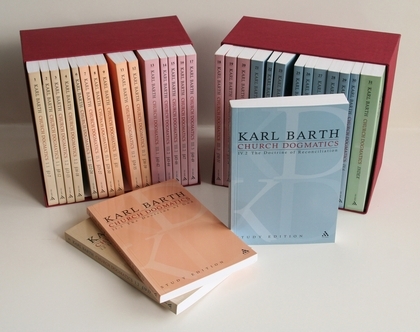 Barth’s emphasis here is to preclude the idea that the Christian life results on account of the mediation of the Christian community, or even the Scripture. Jesus Christ may use these means as an instrument of his Word, but his call to a person is direct and immediate. This is a person’s Baptism with the Holy Spirit, whereby Jesus Christ imparts ‘Himself as at once the Guarantor of God’s faithfulness to him and of his own faithfulness to God’ (33). Second, this divine work whereby Jesus Christ gives himself to specific persons in the work of the Holy is the form of grace in which God actually reconciles the world to himself. ‘Baptism with the Holy Spirit is effective, causative, even creative action on man and in man. It is, indeed, divinely effective, divinely causative, divinely creative’ (34). That is, it is not the human response or the ecclesial work of water baptism which is the means of this grace, but the direct work of Jesus Christ as he baptises with the Holy Spirit. By this grace a person is changed ‘truly and totally,’ and is liberated for their own decision of faithfulness in correspondence to the faithfulness shown them by God. This divine change is so transformative the person can and will never forget it (35). Third, this ‘omnipotently penetrating and endowing’ grace demands the response of gratitude, for this grace not only liberates the person for a new obedience but claims them for this obedience to their new Lord and Master whom they have now acquired. The grace that forgives and frees also commands (35). The problem of ethics is thus raised for him, or more exactly, the problem of the ethos corresponding to it, of the response of his own being, action and conduct. … He has to take up a position in relation to this, the only position in relation to this, the only position which can be taken, but a position taken in freedom. It is not that God’s act on and in man makes of him a cog set in motion thereby. The free God does not act thus with man. On the contrary, what the free God in His omnipotence wills and fashions in Jesus Christ in the work of the Holy Ghost is the free man who determines himself under this pre-determination by God, the obedience of his heart and conscience and will and independent action. Here man is taken seriously and finds that he is taken seriously, as the creature which is different from God, which is for all its dependence autonomous before Him, which is of age. Here he is empowered for his own act, and invited, commanded and encouraged to perform it (35). The human person is set in an immediacy of relation with their God from whose direct command they cannot escape. They have been snatched from the power of sin and death, liberated from their own impotence, and freed from their assumed autonomy whereby they were supposedly ‘free’ alongside God; God has ‘beset them behind and before’ (cf. Psalm 139:5). The criterion of the authenticity of the discharge of all institutional office in the Church is always and everywhere the question whether the one who serves in this or that office is a recipient and bearer of the charisma indispensable to his work, and first and finally whether he is a recipient and bearer of the love which is above all spiritual gifts. At no time, then, in the life and ministry of the community, in the fulfilment of Christian fellow-humanity, can one dispense with the petition: Veni Creator Spiritus. Always and everywhere this must be prayed afresh. Finally, the Baptism with the Holy Spirit is only the beginning of the Christian life, a beginning which must be ever-renewed in its always fresh continuation. Just as the seasons are always renewed, so the fruit-bearing Christian life is ever renewed, and so requires ever-new sowing and reaping, cultivation and pruning, a daily penitence and striving for those new possibilities which lie ahead (39). The whole of the Christian life is one long Advent-season, a life of ‘waiting and hastening’ (2 Peter 3:12) toward the ultimate kingdom, in prayer and eucharist, caught up in the movement of God: ‘the power of the life to come is the power of his life in this world’ (40).